It seems like a minute since I did a beauty post so I thought the best way to bring it back was to share some of my favourite beauty items at the moment. I know everyone was raving about this last year and I am a bit slow but I had so many concealers I just couldn't warrant buying another. Anyway, I finally cracked and can see what all the fuss is about. It's such a lovely consistancy which is something I always look for in a concealer. The colour match is great too. I have light neutral and it's a great comparison for my Mac prolong wear concealer in NW20 which is my all time fave. I like to think I'm not too late to the party on this one. I have to admit ABH is my current favourite brand and I have quite a few products from her now. I'm always a bit dubious about buying products from people that firstly specialise in one thing. 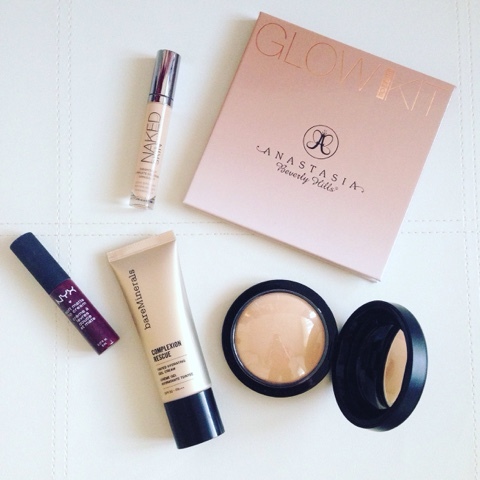 With Anastasia it was always the brows but these glow kits are gorgeous. They can create a subtle highlight or a #HighlightOnFleek highlight with some fix+. Don't worry, I haven't just discovered these but I have a few in my collection now and my recent purchase was the colour Copenhagen which is a beautiful deep plum colour. What I love most about these lip products, however, is the formula. So creamy and buttery, just as the name suggests. I can't wait to buy some more when I visit the US in September as they seem to rip us off a bit in the UK. There's been so much hype over BareMinerals lately and they totally deserve it. I feel like they never got the attention they needed before because they're products are so good for the skin unlike a lot of brands that throw in a load of chemicals, BareMinerals markets themselves as being skin friendly with no nasty ingrediants. I picked up the BB cream as I wanted something light for summer. It has an SPF30 in it, keeps you oil free but not too matte for my dry skin and has a great buildable coverage. This has been a cult product forever but I was never too fussed about it. Then I hit pan on my trusty Urban Decay Deslick powder (review here) and wanted to try something new. As I have dry skin I don't like anything too powdery that's going to sit in my fine lines (yep, I have those!) or that is going to dry me out too much. I wanted something that made my skin glow but kept me from getting oily (jeez, I'm high maintenance). However, this little compact does just that. I have mine in medium. What beauty products are you currently loving?